In times of fear, pedigree helps, but it too has limitations. 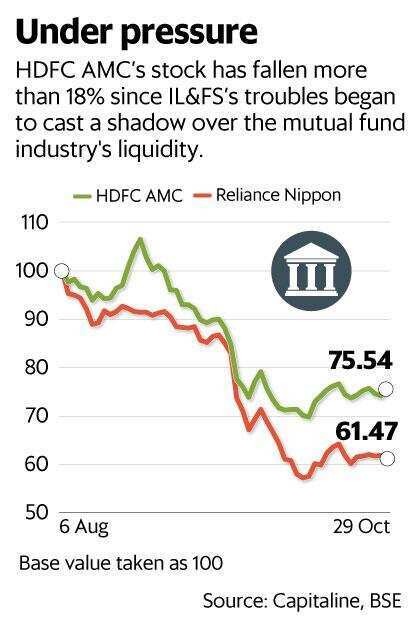 HDFC Asset Management Co. Ltd (HDFC AMC), known for its quality portfolio and size, could not escape the shadows of the liquidity fears in the mutual fund industry. The company’s assets under management (AUM) growth slowed to 9% for the September quarter (Q2) compared to an impressive 21.5% in the previous quarter. Given that the customers were wary of mutual funds in general during September, HDFC AMC found its ability to squeeze the profits a challenge as well. To add to the woes was the rap on the knuckles of fund managers from the Securities and Exchange Board of India (Sebi) on mutual fund expense ratio. Hence, HDFC AMC’s revenues from operations grew at a slower pace of 11.8% for Q2 compared with 20.7% in the previous quarter. Ergo, net profit growth was at a sober 14.5% compared with the previous quarter. That said, the company continues to draw strength from its high quality investments. HDFC AMC’s customer base grew 27% and, surprisingly, its equity AUM grew faster than debt to comprise 52% of the total AUM. The overhang of the Infrastructure Leasing and Financial Services Ltd’s (IL&FS) meltdown on the equity markets and, specifically, over non-banking finance companies’ (NBFC) stocks doesn’t seem to have hurt HDFC AMC much. Recall that the company was the only one that saw its AUM increase by 12% in September month-on-month, compared with an industry-wide fall. Nevertheless, the hit on the AUM growth is fairly obvious given the reported numbers. The bigger question is whether HDFC AMC justifies its lofty valuations anymore. The stock has fallen more than 18% since the IL&FS debacle became public. Even so, it is valued at 33 times its estimated earnings for FY19. Compare it with Reliance Nippon Life AMC, which lost a massive 30% in market capitalization during the same period. The latter has a more sober valuation of 17 times its estimated earnings for FY19. While one quarter does not make a trend, HDFC AMC’s ability to bring back its AUM growth in the coming quarters will go a long way from making valuations look less formidable. For now, analysts are willing to give it a long rope.